SE23 Forest Hill Leather & Suede Upholstery Cleaning | RDA Cleaning & Maintenance Ltd.
Our company provides expert upholstery cleaning services in Forest Hill SE23 area. With years of experience behind our back RDA Cleaning & Maintenance Ltd. has managed to provide quality home and office cleaning services at affordable rates and great final results. All of our upholstery cleaners are experienced, fully insured and ready to tackle all nasty spills, spots and discolorations. Give us a call at 020 3404 1646 or use our booking form and our call center reps will quickly respond and offer you a great deal. We can book you a same day appointment. No extra fees. On the upholstery cleaning market we are mostly famous for the almost entirely positive feedback we receive for our services. In addition to this, RDA Cleaning & Maintenance Ltd. can brag about a thousand new satisfied customers per year. About 80% of them come to us due to a recommendation given by other happy clients. All our upholstery cleaners Forest Hill SE23 follow a strict eco-friendly policy and we never apply products that can harm the environment, your living space, kids or pets. Our high quality upholstery cleaning services are available for both: business and domestic needs. Landlords and real estate agencies can also take benefits of our expert assistance! We work hard and we never leave a place with unfinished job. It is cheap to keep your upholstery fresh with us. What makes us so successful in domestic sofa & chair cleaning in Forest Hill SE23 is the fact that our sanitizing formulas work on all types of sofas. No matter what your upholstery type and material is, we can easily remove the stains, eliminate the bacteria and reduce the dust to the minimum. This is why we begin the procedure by estimating the textile type. Then, we test the most suitable (according to the well-trained and educated upholstery cleaners) on a small amount of the fiber. Be sure, that all procedures are performed with chemical-free cleaning detergents and modern machines. Hovering and deodorizing are always included in the price. Last, but not least, on request, we will apply Scotchgard protection, too. 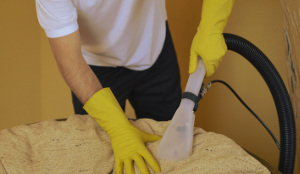 Book Our Expert Upholstery Cleaning In Forest Hill SE23 Now! If you wish to use our upholstery cleaning services Forest Hill SE23 then please give us a call at 020 3404 1646 or use our online booking forms and we will be straight on our way to help you you with your harsh cleaning tasks.